Since it was launched in 1999 CLUAS has been covering Cork bands and the city's indie music scene. 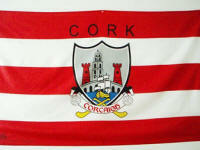 Below are some of the Cork-related articles we have published on our website. Cork has had of one of the most vibrant music scenes in the country this last decade, a fact firmly reflected in CLUAS.com's top 50 Irish albums released between 1999 and 2009, where 4 of the top 25 albums were by Cork acts (stand up Simple Kid and Cathal Coughlan). CLUAS.com is keen to increase its coverage of the Cork music. So, do you live in Cork and are interested in submitting a review of a local gig, band or album release? Then just visit our 'Submit an Article' section and follow the instructions. Anything well written and relevant will be published. Guaranteed.